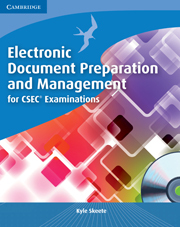 Electronic Document Preparation and Management for CSEC® Examinations provides comprehensive coverage of the CSEC® syllabus revised for first teaching from September 2011. It introduces computing fundamentals, electronic communication and keyboarding techniques before teaching the Microsoft Office (2003 - 2010) skills required by the course. Next, students are shown several aspects of document preparation, complete with sample documents. After covering document management and ethics, it gives SBA tips and exam papers (with answers included on the CD). Exercises and summaries are found at the end of each chapter. The accompanying CD-ROM is packed with material including interactive revision questions, PowerPoint presentations, tutorial videos, exercise files and a comprehensive glossary. Learning objectives at the start of each chapter, list in simple terms what is covered. Exercises and summaries are found at the end of each chapter. Key points are underlined to emphasise their importance and ensure they are not missed. Key tips are easily accessible for revision or to use for help whilst on the computer. Labelled screenshots provide a clear visual demonstration to help the student. Step-by-step instructions give students clear and direct guidance. Clear structure and use of bulleted or numbered lists helps students navigate easily through the text for class work or independent study. The accompanying CD-ROM is packed with material including interactive revision questions, Powerpoint presentations, tutorial videos, exercise files and a comprehensive glossary.